Your nails can last up to 2 weeks depending on how they are cared for. You can also reuse these nails if they are removed carefully! Nails themselves are not adhesive. The Nails can last 2-3 weeks or be reused with proper care and adding glue as needed! 500 NATURAL OPAQUE VERY LONG Stiletto points - Full Cover Nails from PINK CANDY. 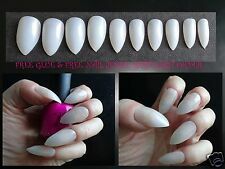 500 very long stiletto type nails you can paint yourself - amounts are approximate. Paint in any colour you wish and add crystals for a gorgeous effect. 600 FLEXI LIGHTWEIGHT -NEW VERY LONG LENGTHFull Cover COFFIN SHAPED Nails 12 sizes - NAIL GLUE IS NOT INCLUDED. COFFIN type nails to paint yourself - amounts are approximate. Paint in any colour you wish and add crystals for a gorgeous effect. Ultra soft, ultra flexible nails. 24 nails in 10 graduated sizes. So simple and easy to use you'll wonder you haven't used them before! The Illustrated Nail Hazy Daze 24 Pink False Nails Includes Buffer & Glue NEW. Condition is New. Dispatched with Royal Mail 2nd Class Large Letter. REMOVING YOUR NAILS: ♥ Soak your hands in a bowl of warm water and gently pry them off with the orange wood stick provided. Two nails in each size 0-9 will be included by default. APPLYING YOUR NAILS. Instant Self Stick Nails. Style: Petite. No pick up service will be provided. 120 Natural Opaque - Petite Short Full Cover Plain Finger Nails - NAIL GLUE IS NOT INCLUDED. 120 natural opaque short nails you can paint for yourself. Paint in any colour you wish and add crystals for a gorgeous effect. Coffin shape Extra Long in length. These nails can be applied using glue or false nails adhesive tape. How to apply nails for a perfect fit and stick Size the nails up on each finger for an accurate fit. Hand Painted Designed Nails. Professional Nails Straight To Your Door. -20 Designed Nails. -Nail File. -Cuticle Stick. Can be reused and last for up to 2 weeks if used with care.